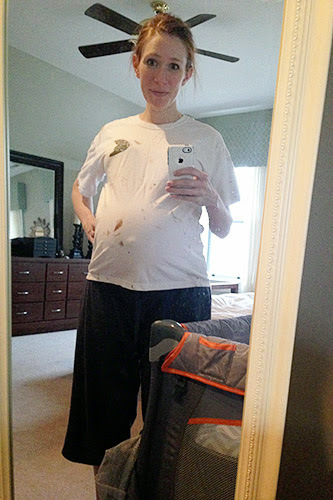 Just as I’d hoped, once Baby P was officially full-term, we were down to taking care of those little things around that aren’t super-duper important but would be nice to have done before baby comes home. Things like stocking up on toothpaste and toilet paper, painting my toenails while I can reach them, and... yes, even stockpiling blog posts (so maybe I am writing to you from the past, but I promised I’d be here three days a week!). But one project that I needed to finish before he came home? 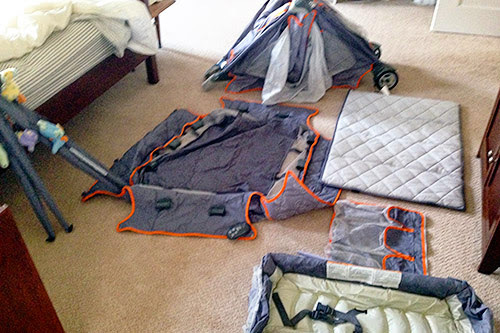 Assembling his bed – not the crib in his nursery, but the one he’ll sleep in when he first gets home! See, although Baby P’s nursery is mostly put together, he’ll actually stay in our room for the first several weeks of his life. Rather than get a separate bassinet, we decide to just use the bassinet function of the pack n’ play we inherited from Baby P’s cousin. So, while Mr. P was away at a tournament with his students a few weeks ago, I decided to tackle assembling it solo. It was.... daunting, as you can see in this photo I texted Mr. P.
With no instruction manual, natch. There were lots of ALL CAPS in the ensuing texts. But! I figured it out in the end! And texted that to Mr. P as well! 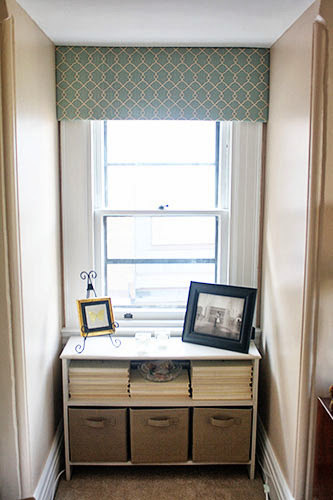 Though we’ll likely keep the bassinet right by our bed at first, I wanted to be able to roll it into the dormer window of our bedroom when we want it out of the way. 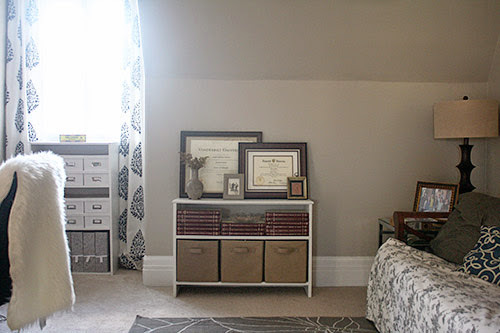 But this crazy nesting lady wasn’t wild about cramming this semi-permanent furniture in front of those shelves underneath the window (seen here before I painted, after installing the DIY pelmet). It looked weird having the bassinet shoved in front of it, and anyway, sometimes I need the stuff from those shelves! If the bassinet is going to be here for some time, I wanted it to look like it belonged there. So I wanted to relocate those shelves. But to where? Well, remember how I’ve been hunting for the magical perfect inexpensive antique credenza/dresser for the office? I haven’t found it yet, I might never find it, and guess what? Those shelves will do in the meantime. Except... they really needed a coat of paint. Good thing my painting shirt barely fits! 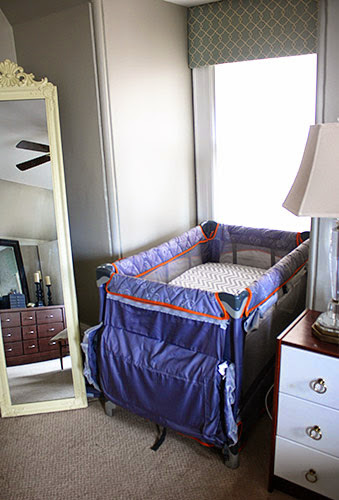 Ugh, see how the bassinet sticks out in front of the mirror?! 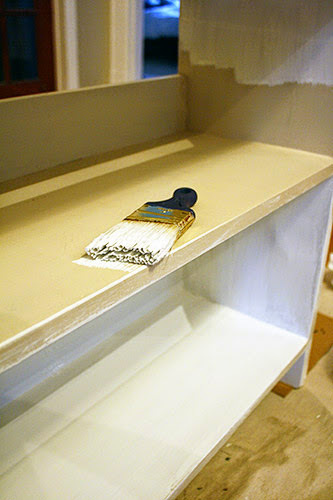 Those shelves have got to get spruced up and out of the way. Let’s do this, nine-months-pregant belly and all. 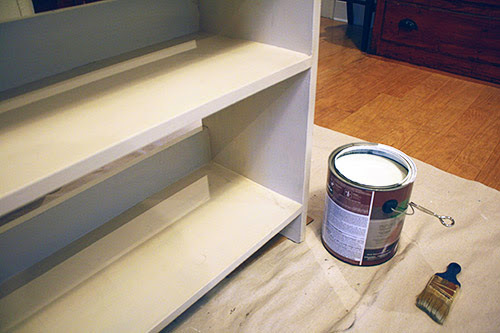 That’s the same white that I used for the china cabinet in the office, by the by. Continuity! Then it was just a matter of letting it cure, moving it into the office, and “styling” it. 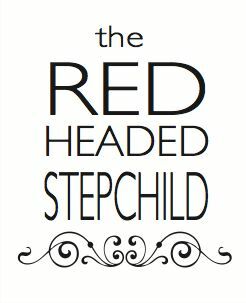 (“Styling” in quotes because vignettes have never been my forte, and also it still sounds pretentious to adopt decorator-speak). Ta-da! The cloth bins on the bottom are basic Closetmaid ones from Target, which hold my purses and our travel gear (garment bags, money belts, that sort of thing). And all those books are part of a fancy piano literature series – in the bedroom, I faced the spines inward since I didn’t love the maroon, but they look fab in here! I finally retrieved Mr. P’s and my terminal diplomas (both from the institution where we met!) from under the futon, where they’ve lived since we moved in, and put them on display. High five for higher education! Now if I could properly matte mine, so it would at least be straight in the frame. Ahh well, details. 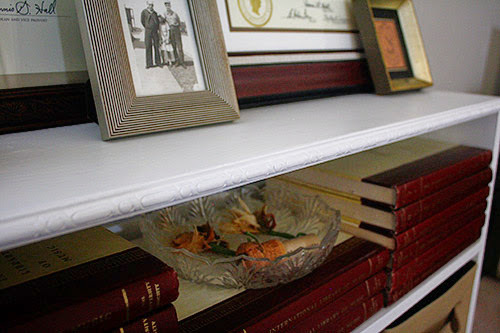 On the whole, I really like these shelves here – far more than I expected! 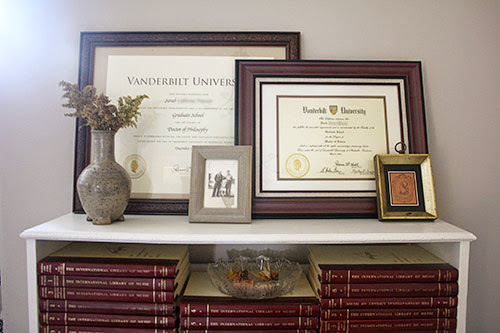 Maybe they’re not the magical unicorn credenza, but they fit in nicely and, with the diplomas and hardback books, make the office feel more, well, office-y. The bassinet fits perfectly in the dormer window, yay! And just making the baby’s bed a more permanent part of our bedroom helped to get my head in the game of being in a family of three. After all, we are rearranging our lives around him, right? Might as well rearrange the furniture while I’m at it! 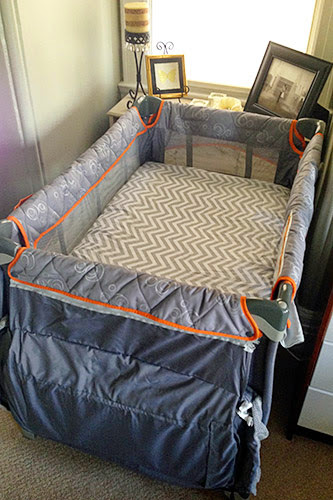 Wow, cool pack&play; never seen one that coold conert to a basinet. Praying you have a safe and healthy delivery. Good luck! Looks great. Appears the only thing left is to bring Baby P home soon :) Best wishes for a smooth safe and healthy delivery for all! Double wow to all of my typos in my previous comment! I guess I was too focused on trying to spell bassinet correctly, which of course, I didn't, ha!